Eucommia Ulmoides - Du Zhong - Tochu. Eucommia has many substances including: geniposidic acid, iridoids, aucubin, gallic acid, protocatechuic acid, chlorogenic acid and caffeic acid, (-)epicatechin, catechin, n-octacosanoic acid), tetracosanoic-2, 3-dihydroxypropylester, rutin. A new flavonol glycoside, quercetin 3-O-alpha-L-arabinopyranosyl-(1-->2)-beta-D-glucopyranoside, and known flavonols kaempferol 3-O-beta-D-glucopyranoside (astragalin), quercetin 3-O-beta-D-glucopyranoside (isoquercitrin) were isolated from the leaves of Eucommia ulmoides. China has thousands of years of history to produce tea. 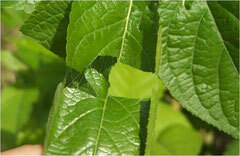 E. ulmoides leaves and E.ulmoides male flowers could be made into tea, and traditional tea methods in china are general used to prepare these types of products. 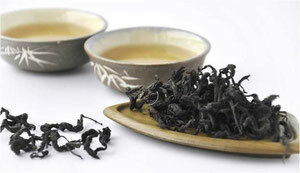 Because they are rich in nutrients and bioactive constituents, they are very good health care tea. Eucommia Leaves elliptic or ovate leaving it long 7-15cm, width 3.5-7cm. Surface yellow-green or brown, slightly shiny. Apex acuminate, base rounded broad wedge formation with serrate margins, with short petioles. Crisp, twist the fragile, broken white rubber surface a small amount of silver wire connected. Smell, taste bitter. Eucommia Eucommia Tea tree leaves are picked, processed through the traditional method of tea made of the health drink, taste slightly bitter and sweet and catchy, Changyin healthy, especially before going to bed drink a glass of good, without any side effects, health value high consumption of convenience. 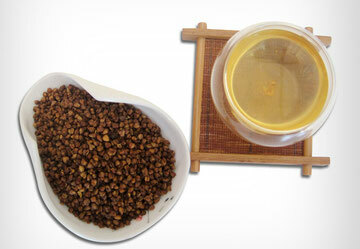 Buckwheat tea, (also as soba tea), has been used for a very long time in China. Contrary to popular belief, buckwheat bears no relation to wheat; it is the seed of a fruit related to rhubarb. The buckwheat plant grows small white flowers and bright green leaves. The groats, or seeds, are used to make buckwheat tea. it tastes rich and beefy, like coffee but without the bitterness. Other people liken it to a nutty-flavored tea. In truth, it has many different flavor notes, rather like a wine, and you may end up focusing on other flavors than other people.almost everyone agrees that the scent of the tea is quite strong, but ultimately pleasing. Although many people find the taste quite good, the real reason most people are trying buckwheat tea is because of its excellent health benefits. These benefits have been known for many years in certain cultures, but they are just recently coming into the mainstream for the everyday person to enjoy. For starters, buckwheat contains several vitamins and minerals such as B1 and B2. It also contains a bioflavonoid called rutin that encompasses the benefits of both green tea and red wine as well. Essentially what rutin does is strengthen capillaries as well as helps to fight off free radicals. This means that it helps people suffering from high blood pressure, arteriosclerosis, and can even help prevent a very large amount of different types of cancer. On top of rutin, buckwheat also contains a compound called choline. Choline is one of the members of the vitamin B complex. This one in particular plays an integral role in proper metabolizing, and it also decreases cholesterol and lowers blood pressure. The good news does not stop there. 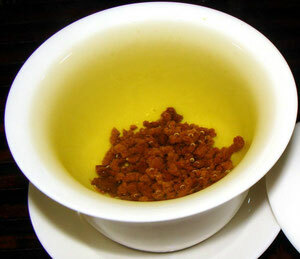 Buckwheat, particularly drinking buckwheat tea, helps the body prevent the accumulation of body fat. It also enables your body to produce healthier and more regular bowel movements. To top it all off buckwheat and its tea variant fit into a low-calorie and well-balanced diet. Even the strictest regimens can easily include this tea; it will not throw off dietary restrictions.